"THE STAR" is released as one of the first in a long line of "Come Play With Me" activity books. "THE STAR" from Judy Mastrangelo is available now! KING OF PRUSSIA, Pa. - Dec. 3, 2018 - PRLog -- It was announced early December that leading Western publishing company Dusty Saddle Publishing would be releasing the first in its line of "Come Play With Me" activity books through their Imagination Books imprint. These new, high quality illustrated books include paintings, poems and imaginative characters. The books in the range have all been designed and created by leading American artist Judy Mastrangelo. "The idea of combining great art with a voracious public desire for activity books makes this new product line incredibly important to the company," Chairman Bruce Bennett explained earlier last week. "We are very sure that this range will become extremely successful." The first book in the series "THE STAR" was released at the beginning of December. It is illustrated with beautiful, colorful, and whimsical paintings by world renowned artist Judy Mastrangelo. It contains the entire immortal poem, which is also known as "TWINKLE TWINKLE LITTLE STAR," written by Jane Taylor. This book also contains several fun filled interactive bonus pages with things to create, such as: Coloring pages, Crafts and a Recipe to make, and "How To Draw Pages". "THE STAR" is certainly beautifully put together, handsomely designed and delicious in every way. This book will make a fine addition to the collections of those who love great artwork. 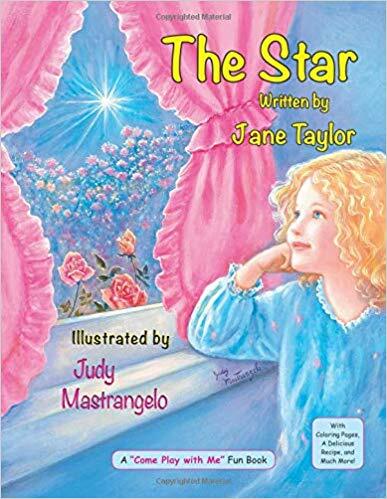 You can learn more about Judy Mastrangelo and "The Star" by contacting Dusty Saddle Publishing directly via their website https://judymastrangelo.com/books-2/imagination-books/the.... You can order your copy of "THE STAR" from Amazon by clicking here (https://www.amazon.com/Star-Come-Play-Fun-Book/dp/1731020...).